No one knows locks better than Melhem Juan, a security professional who has worked in the business for the past 6 years. From car locks to door locks to padlocks, he’s seen it all and helped hundreds of customers keep themselves and their belongings safe. In early 2016, Melhem decided to take his business online, and soon, E.D. Locks was born. E.D Locks aims to make sure every customer is 100% satisfied with their purchase and prioritize customer service, fast delivery, and competitive prices. But, despite all of that, there was just one problem. While E.D. Locks will help a customer ensure they are buying the correct lock for their needs, it can sometimes be hard for consumers to trust the products they purchase online. After all, this isn’t a toy to play with or a frivolous handbag purchase. These locks and mechanical parts are the difference between safety and vulnerability. Other features that have contributed to E.D. 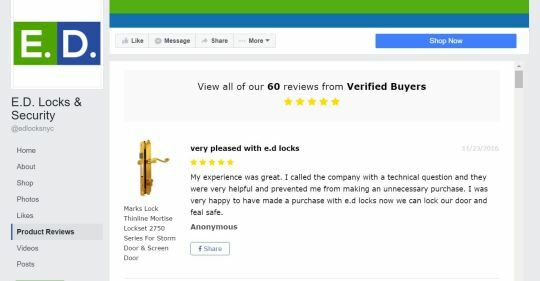 Locks’ success are the Facebook Reviews tab and Social Push that allows reviews to be automatically posted to the company Facebook page and shared in home security circles. E.D. Locks made the switch to Stamped.io from the Yotpo app due to the hands-on customer support and lower pricing model. Reviews have now increased more than 100%. Melhem believes it’s all down to the ease of leaving a review, on both sides of the process. His customers love the in-email response forms and he loves the automation of the review requests, leaving him to build the business. 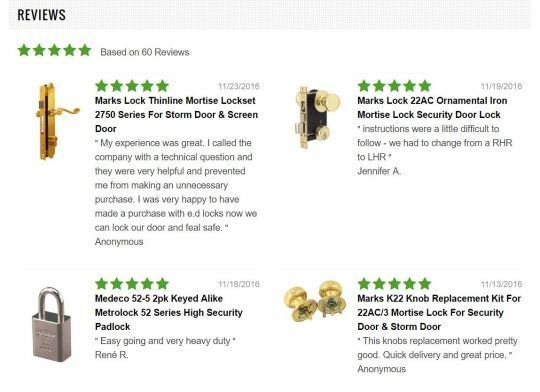 The key (no pun intended) is prominent placement of the product reviews on the website, as Melhem’s audience wants this information right at their fingertips. The website enables the customer to search by lock type, and then displays a 5 star rating system underneath each product with previous reviews. The result is a personalized experience for E.D. Locks’ customers. Instead of buying mechanical parts from an impersonal online store, they’re purchasing tried and tested home security products that have been recommended by consumers just like them. And what does Melhem envision for the future? To see how Stamped.io can help you take your own product review game to the next level, simply download the free version to get started. Google Just beneath, are a lot of entirely not related web-sites to ours, having said that, they are surely worth going over. Google Usually posts some incredibly intriguing stuff like this. If you are new to this site. Google Below you will obtain the link to some web pages that we consider you ought to visit. Hey there would you mind letting me know which hosting company you're working with? I've loaded your blog in 3 different internet browsers and I must say this blog loads a lot faster then most. Can you suggest a good web hosting provider at a honest price? Thanks, I appreciate it!